Last time I gave you 5 reasons the Lakers WOULD win the 2009 NBA Championship, and this time I will give you my top 5 reasons why they may fall short. Andrew Bynum will overexert himself in the summer and reaggravate his knee injury. In Bynum’s exit interview with the media he said he would be ready to begin running in early July and from that point on he hopes to work with the same personal trainer that he did last summer (READ: the guy who helped Bynum bulk up and become the up-and-coming superstar center that we witnessed early last season). The first thing that comes to mind for me is whether he will be cautious enough to take the appropriate precautions so that he does not reaggrevate his serious injuries from last year. If he doesn’t the Lakers may have to make due with what they had last season. 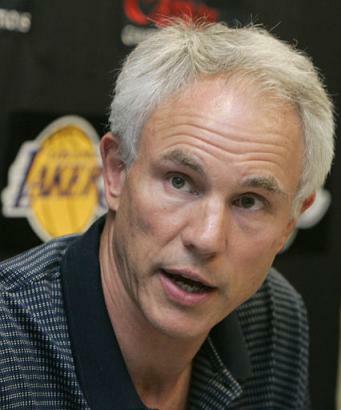 Mitch Kupchak does not make any strategic veteran acquisitions. One of the greatest changes Kupchak made in the last couple of seasons outside (1) the acquisition of Pau Gasol and (2) not trading away Andrew Bynum was signing Derek Fisher. Fisher brought veteran leadership to one of the league’s youngest teams and acted as a mentor for some of the Lakers’ young guards (Sasha and Jordan). If the Lakers are to win the championship next year, they very well may need to take a page out of the Celtics’ book and sign a strong, savvy veteran PF or SF to handle the physical attacks that opponents will bring at them. The league knows now that strong, tough, physical defense can slow down the Lakers, so LA will have to preempt these new schemes my getting bigger, more aggressive veteran players that can play big in the middle. Kobe Bryant doesn’t have enough in the tank/can’t recover from pinkie injury. Lets face it. Kobe Bryant has probably played more regular season, postseason and USA team games the last 10 years than any player in the NBA. He’s also a ferocious gym rat when he’s not “in season” (if you can ever say that). One might wonder how long Bryant can keep up such a torrid pace amid his increasing age and his minor injuries. If Bryant comes out sluggish in 2009 due to fatigue or he cannot sufficiently recover from an inevitable pinkie operation after the Olympics, the Lakers may have to begin the season without their superstar MVP, perhaps hampering their ability to win a championship. The West becomes too competitive. The Lakers may improve 10 fold and still not win the 2009 NBA Championship if they simply cannot get out of their uber-competitive conference. At least 5 teams that I can think of in the West could have been in the Finals this year (and might have even matched up better against the C’s) and if the competition increases, it just may be too difficult for the Lakers to get back to the Finals. Their team defense/physical toughness does not improve. Phil Jackson probably realizes that team defense is probably the single most important thing he needs to teach to his young team this summer. The Lakers also need to improve their toughness around the basket, which I believe can only happen if Pau Gasol is “broken down” and rebuilt as a physical interior defender and post player (no more facing the basket). Don’t forget to sign up for our RSS feed! Andrew Bynum will be healthy (at least we hope). Bynum averaged 13 points, 10 boards and 2 blocks a game in only 28 minutes a contest last season. He shot 64% from the field and was a steady big man in the middle for the Lakers not only on the offensive side, but on the otherwise weak Lakers defensive interior. He provided many of the Lakers defenders a last resort in the paint if their man got by them. He’s young, he’s tough and he’s shown he can bulk up and be the player that Kobe Bryant wants to play alongside of—as evidenced by his emergence early on this season. Kobe Bryant will be hungrier than ever to win another NBA Championship. Not many players can say they have won three world championships. At the same time, not many can say they’ve lost 2 in a row, either. Kobe Bryant is the utmost competitor and you can be sure that he will be working hard all summer to make it back to the Finals. It’ll start with the Olympics, and I’m sure it will end with countless hours spent in the gym pumping iron while his pinky recovers from an inevitable surgery that will need to be performed. Jackson will continue to harp to Kobe the importance of team basketball (which evaporated from his mind during the Finals) and the need to develop young players. Expect Kobe to take fewer shots next season in favor of more assists, more rebounds and better defense. He’s won the scoring title with out Shaq, the MVP of the regular season without Shaq, and will be wholeheartedly determined to win that elusive Title without Shaq next season. Pau Ga-soft and Lamar O-Dumb will come into the season BIGGER and MORE FOCUSED. There’s no doubt in any of our minds that these two players have the talent and the potential to be superstars in this league. In Pau’s case, he rolled through the playoffs in the West without many roadblocks, but encountered a much too physical, energetic and determined Kevin Garnett in the Finals. In the early stages of Game 6, Pau’s main drawback was brought front-and-center when he was nonchalantly tossed to the ground by a quick, physical move by Kevin Garnett. If the Lakers are going to win a championship against a team like the Celtics next season, Pau Gasol will need to hit the gym harder than he ever has this summer (and this will be hard because he will be playing for Spain in the Olympics), work with Kareem (Lakers Special Assistant Coach for big men) on his positioning and toughness on the block, and improve his soft defense. In Lamar’s case, the man just needs to be more focused and keep his head in the game for 48 minutes. Stupid fouls on the defensive side, overambitious drives to the hoop that result in offensive fouls on the offensive side, and just the general stupor that he usually finds himself in during big games HURTS the Lakers. Lamar needs to mature (and something tells me after this year’s Finals he will) and needs to understand exactly what the Lakers need from him—a focused intensity mirroring that of Kevin Garnett’s. The Lakers bench will improve with this experience. Without the emergence of Sasha, Jordan and Ronnie during different parts of the season AND playoffs for the Lakers, LA probably wouldn’t have earned the Number 1 seed in the West and home court for that duration. The Lakers bench was completely unknown to the league before this year and going forward I believe the confidence and experience that many of the young players on the bench have collected will help them going into next season. Sasha should continue to improve his defense so that he can stay with the leagues premier SGs (Allen just clowned him last game). Jordan should look to put a little muscle on and improve his jump shot (especially his three). And Ronnie should continue working on his low-post defense and mid-range jump shot. The Lakers will improve their defense. Lets be honest, the Lakers had no real trouble scoring against any team this year outside of the Boston Celtics. What they did have trouble with at times was TEAM DEFENSE. We all know Kobe has been All-NBA First Team Defense and that Lamar is a crafty defender as well, but the Lakers have really struggled with their spacing on defense. Routinely during the Finals, a player would get beat and nobody would be at home in the middle to help. I think Jackson and his entire coaching staff will begin to preach defense more and more this summer to the team. 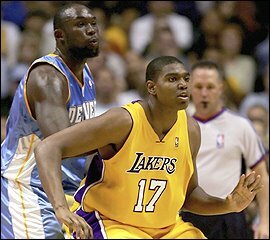 It will help enormously if Bynum can come back from his knee injuries and solidify the center of the defense like he did early on in the 07-08 season. Check back in next time for the five reasons the Lakers will NOT win the NBA Championship next year. Also, be sure to subscribe to the FBPs RSS feed! Fantasy Focus: Derrick Rose or Stephen Curry?